Owing to the efforts of our skilled professionals, we have been constantly engaged in offering a qualitative assortment of Street Clock. This Victoria Station Clock has Roman Numerals, Glass. This clock would look great in a home or office with existing timber features such as timber furniture or timber floor boards. We have lot more designs for this kind of ancient clocks! Made of iron steel and batery operated clock ancient quality . 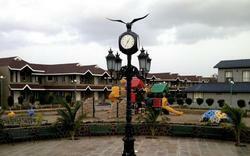 As an affluent name of this domain, we hold expertise in providing high quality Designer Tower Clock. We are specialized in manufacturing and supplying a qualitative range of Nautical STATION Clock. Clock station brass antique finised size18 inch . We manufacture station clock in brass/copper/nickle/black in 8", 10" and even in 24" as per the customer order.Its two side double station clock with brass handle that can be placed in drawing room, lobby etc and gives aesthetic look and antique look as well. 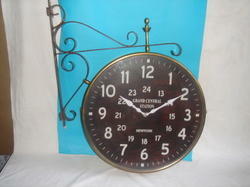 We have with us an assortment of Station Clocks, that are attractive in look and unique in design. These clocks are generally installed at railway stations, office premises, canteens and other places. Our range is provided in varied shapes and frame designs to meet the diverse choices of clients. tower clocks are especially made for outdoor locations suitable for public or private buildings, schools, churches, mosques, universities, memorials, etc. Operated by imported high torque quartz movement. With internal illumination and completely weatherproof casings. This is one from the wide range of Antique Replicas of Station clocks in various face diameters. This is made of highly polished seasoned wood/nickel.